Norma Torres Mendoza, and her mother, Carmen Torres. 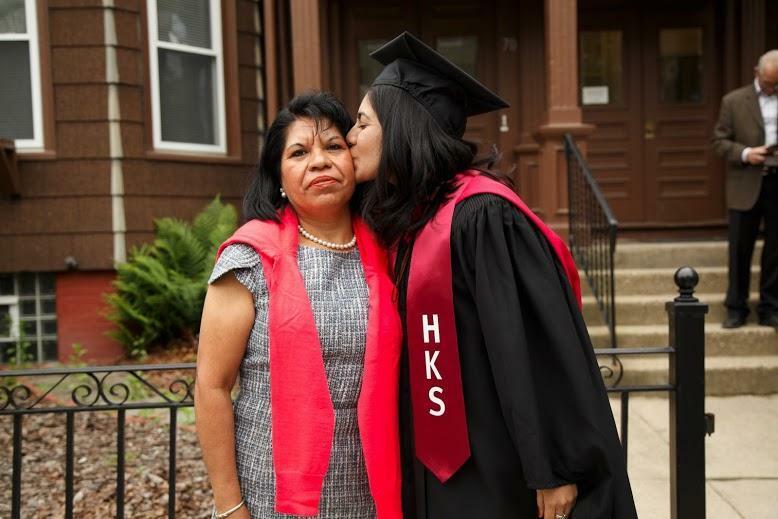 Norma Torres Mendoza says she was reluctant to put her mother on a plane to Boston to attend her graduation ceremony at Harvard University’s John F. Kennedy School of Government this week. There was the fear, Mendoza said, that her mother, Carmen Torres, would be stopped by airport officials and possibly detained. Even worse? The thought of her mother being deported, she said. “We didn’t want to take the risk of her being questioned,” said Mendoza of her mother, who is an undocumented immigrant from Mexico and lives in Texas. So the 25-year-old, amid end-of-the-year events and trying to move out of her apartment, flew to Houston to meet her mother last week, then gassed up a car and drove her about 2,000 miles back to Cambridge. On Thursday, when Mendoza receives her graduate degree in public policy, her mother will be there, watching proudly from the crowd. At 14, the “Orange Is the New Black” actress found herself alone in Boston after her parents were deported to Colombia. “The trip was a little nerve-wracking, but also very exciting,” said Mendoza of the three-day drive. “I’m just glad that she’s here.” Mendoza, an only child, said she came to the United States with her mother in 2000. When she arrived, she didn’t speak any English. But from a young age, Mendoza loved to read and was inquisitive, she said. So she forged ahead, while adhering to her mother’s advice that getting an education was the most important thing in life. Mendoza, who was the first in her family to receive an undergraduate degree, not to mention her graduate degree, is able to live and work here because of Deferred Action for Childhood Arrivals, or DACA, an executive order that lets qualifying immigrants who came to the United States as children temporarily avoid deportation. US Immigration and Customs Enforcement didn’t immediately return a message seeking comment. Mendoza said having her mother, who has worked as a house cleaner much of her life, in Cambridge for commencement means a lot. Finishing her degree, Mendoza said, is a way to thank her mother for her support growing up. Mendoza has been part of many different communities. At Rice University she helped launch a group that prepares students from underserved communities for college. At Harvard, she was the president of the Harvard Latino Student Alliance; a co-program director of the school’s Democratic Caucus; and co-coordinator of the Public Policy and Leadership Conference. Mendoza was also an organizer of the second annual Latino Graduation, which took place Tuesday at the school. Mendoza’s mother walked across the stage with her daughter at the event. “That was such a beautiful moment,” she said. This summer, when Mendoza wraps up in Cambridge, she’ll return to Houston, again with her mother, to begin a fellowship from Mi Familia Vota, a nonprofit organization that gets Latino voters active in their communities. Despite all of her achievements, the fear of deportation lingers in the back of her head. Steve Annear can be reached at steve.annear@globe.com.